Lance Corporal Dan Nansoz, 24, of 39 Engineer Regiment, gives a final salute to the Royal Air Force, on the handover of RAF Kinloss to the Army's Royal Engineers, after 73 years as an operational air base. A huge upgrade to RAF Lossiemouth – the nation’s first defence against incursion by Russian forces – means Typhoon jets based there will move to Kinloss during summer 2019. And it has been revealed that the first submarine hunting Poseidon P-8 spy planes will also operate from the base, which is now run by the Army, when they enter service in February 2020. As part of the plans, the base’s runway will have to be upgraded – forcing the planes to find a temporary home. Yesterday, the RAF stressed it was working to minimise the disruption to personnel and operations. Typhoons will operate from Kinloss for about six weeks during the summer next year. However, the quick reaction alert (QRA) operation, which requires jets to be on stand-by to respond to unknown planes approaching UK airspace will move to Leuchars, which is also a former RAF base now operated by the Army. RAF Kinloss was home to the previous generation of maritime patrol aircraft, the Nimrod, before the fleet was scrapped in 2012. Much of the personnel have been retained to work on the Poseidons – meaning they are now poised for an unlikely return to their former home. 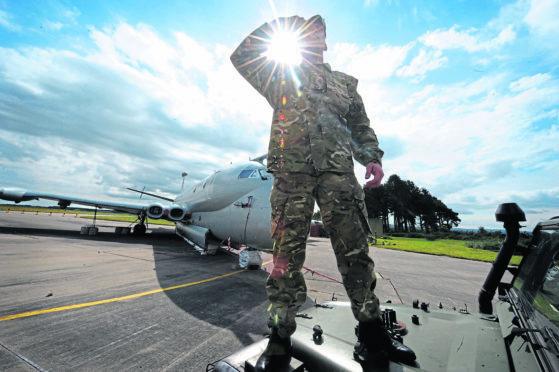 Moray MSP Richard Lochhead said: “There is a strong sense of irony that after closing the base the MoD now need the runway for the Nimrod’s successor. “If Kinloss is to be maintained as a back-up airfield for RAF Lossiemouth it would be useful to know to what extent the MoD is preparing to invest in it. Last year the MoD confirmed that Kinloss Barracks could become home to another Army battalion before 2022 after it was confirmed it was in line for further investments as part of restructuring of the force in Scotland. There are currently about 800 soldiers stationed at the base as part of 39 Engineer Regiment. Military bosses chose Kinloss as the best option for the temporary move due to there being no need to relocate personnel while technical facilities at RAF Lossiemouth will still be able to be used. A RAF spokesman said: “During the summer of 2019, routine Typhoon squadron flying will briefly operate out of Kinloss and the QRA north function will temporarily relocate to Leuchars. The military base in Kinloss has staved off repeated threats to its continued existence in recent years. More than 10,000 people backed a huge campaign in 2010 when both bases in Moray faced the axe. They play a vital role in their communities. At the time, the UK Government bowed to public pressure and retained RAF Lossiemouth, but nonetheless opted to close Kinloss after cancelling its order for replacement Nimrods. Initially it was feared the base would be lost completely amid concerns it could become derelict, with no future occupants identified. But the following year the Ministry of Defence confirmed that the Army’s 39 Engineer Regiment would move to the north-east from 2012 with the base to become known as Kinloss Barracks. Test flights continued to be made by Tornado jets to the runway there because it was needed as an option for emergency landings. However, when the aircraft left RAF Lossiemouth last year the Kinloss runway was deemed surplus to requirements. Closure threats again surfaced about the barracks during 2016 after it emerged it was being considered for closure as part of MoD cost-cutting proposals. However, it was later decided to retain the base when the decision was made to dispose of neighbouring Fort George instead. It is now hoped another battalion will move to Kinloss Barracks in the coming years to boost its compliment, which is about half of what it was when it was operated by the RAF.